Inside an observatory a husband and wife hold their infant son with the realization they will soon be dead. They recall the origin of Superman, how he was sent to Earth to survive and became a symbol for good and a champion of life. Earth is the only hope their child has and so they rocket him away and await their destruction. The child learns knowledge of his dying world from the onboard systems of his ship as he hurtles towards Smallville, 3008. Jun and Mara, a childless loving couple are passing a field and watch as a ball of light crashes down near to them and an alien baby crawls out, last survivor of his world, beckoning for love and affection.... a fairy tale ending. Clark is racing towards the elevator calling out to his colleagues to hold it for him. But Clark Kent is just another reporter, just another man... there isn't anything special about him. Clark looks at his reflection with a sadness in his eyes, it's obvious even after ten years he can't quite fit in. Enter his pal Jimmy, the Daily Planet underdog. Jim reassures Clark that he isn't alone and before they can go in depth Perry White stomps through the newsroom. The photo Jimmy took of General Zod - the photo that would have changed his career forever... was a non starter. Perry wasn't in the mood to coddle the boy and sends him on a coffee errand. Naturally this was a distraction so Perry could give Clark his daily pep talk. Clark was never going to get anywhere if he didn't fit in, he ought to get more proactive friends, get more self confidence... the rag on continues, but as usual Clark had his attention drawn to something else... something dangerous. Making excuses to leave Clark leaps out of the storage room window and quickly changes to his Kryptonian suit. A large android resembling Brainiac is crashing through Metropolis park seemingly intent on drawing attention to itself. It naturally alerts Clark who proceeds to smash parts of the robot before a video screen hisses open and a man with blond hair and green skin begs for his attention. He tells Clark that this is a last resort, he had never wanted to involve Superman but now it seemed like the only way to save his friends. Clark was a boy who never really fit in, he was clumsy, afraid of getting close to people and people like Brad Wilson didn't help. It earned him a reputation as a class-A loser with no one he had anything truly in common with. Cosmic Boy, Saturn Girl and Lightning Lad had snuck back in time to meet their idol and inspiration. Clark is understandably geeked out of his mind. Three people just like him! For some reason they wanted to thank him and give him a gift for what he had done - or technically was soon to do. Saturn Girl reassured him that soon he wouldn't have to hide, soon he'd be able to fit in and be someone. Of course Cosmic Boy then gave him membership into their club and a shiny golden ring. But literally seconds later they had to bid their goodbyes and revealed their hidden ship - a time bubble. Clark couldn't resist this chance he begged to go with them into the future, reluctantly they decided to do it, how could they resist the chance to work with the man that inspired them? And so in the future Clark grew to be a Superman alongside his teammates: The Legion of Superheroes! With his memories returned, Superman recalls that other Legionnaires had recently sought him out but realizing he had locked memories had dashed back to the future. Something terrible has happened and now only Superman can help. Superman squinted at the video screen and�realized it was�Brainiac 5 speaking to him. Brainy tells his friend this is a last resort, the only�calculable chance of some semblance of success. With another clank the the robotic construct opens up to reveal a time sphere and a Legion flight ring - calibrated for Clark. He activates the sphere and in an explosion of light the robot vanishes and Clark is in the rubble of the Legion clubhouse, the year 3008. An explanation from Brainy never comes. He isn't there to greet Clark as promised - instead Special Police are there and threaten to kill the pretender. It turns out they are in the middle of a rescue mission.�Colossal Boy smashes in, knocks away the police and grabs a cache of flight rings, and a blast from the past interrupts him. In flies Dawnstar and Wildfire shocked also to see their Kryptonian friend. The worry on their faces increases when they�realize Brainy had defied them. Worse still he's been missing for six months. The remnants of the Legion decide that Kal has to go back. That option is quickly crushed as the time sphere shatters. The Special Police have regrouped and a barrage of energy forces the heroes back. Clark overhears the soldiers talking of the Justice League and how he is a blasphemous impostor. Clark decides the best option is to be proactive. He steps in to use is powers to protect his team and is promptly shot through the hand! Things are going from bad to worse! 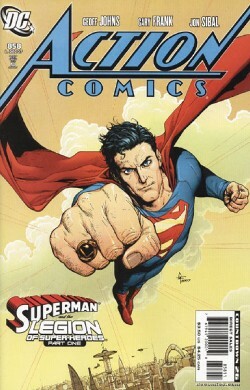 Colossal�Boy helps them escape and Clark uses his flight ring to compensate for his powers failing. Dawnstar shows him the source of his power shut down. The future has a red sun! Story - 5: HOLY FREAKING HELL! BUY THIS BOOK! I have read, reread and rewrote this review a few times. I can't believe how good this story is. Whatever the comments this is by far the only story this year that has me filled with anticipation. The New Earth influences are clear but the exaggerations made about how the oscar-winning movie is being integrated into the comics is a stretch it's barely noticeable here and I have to say in context the teaser posted a few days ago fits in more with the story - it isn't about Clark being a dweeb, its about Clark deep down feeling like an alien among men. The story behind the Legion Clark knows and that which Kara does isn't something that concerns me right now, though I am a little worried that Clark just upped and left - no cellphone call to Lois & Chris etc... but that's a niggle I am not willing to dock a point for. The delays messed up Last Son, Bizarro World, etc... but damn it the stories were good. I really can't find a fault. This my friends harks back to the days when we had weekly Superman comics, high in calibre and leaving us drooling for the next issue. Art - 5: If the story hadn't blown me away the art has! I am not convinced by Jon Sibal - I find his inking diverts from the strength of the pencilling and the�coloring. After the third read through I began to really immerse myself in Metropolis and this bleak future. Gary Frank brings over the style that had grown in Supreme Power/Squadron Supreme and having a slight animated style coupled with realistic physiology is a welcome addition to the Superman style. Sometimes when I read the books I wonder how many of the artists actually studied human anatomy. Cover Art - 5: I'll admit when I saw the previews I hated it but in person it is... well... breathtaking.